Warren Loper is an award-winning member of the Boots and Buckles 4-H Horse Club. 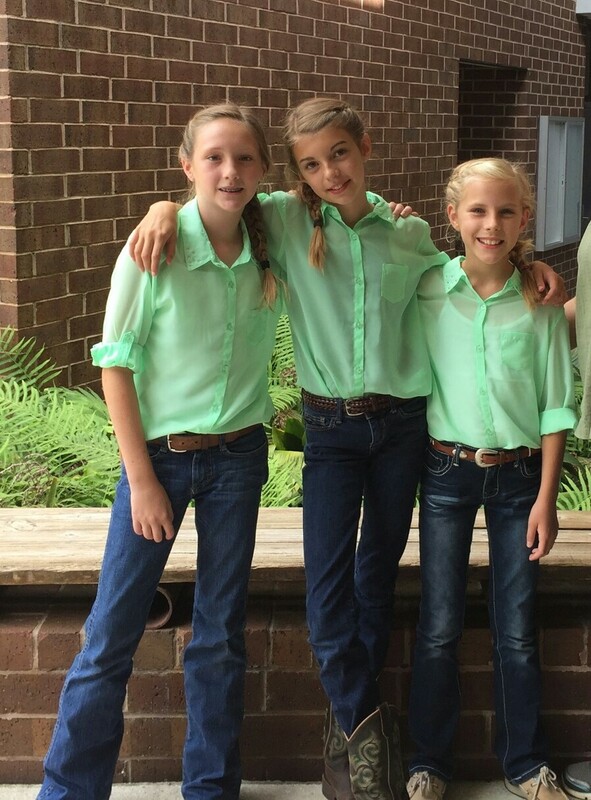 Earlier this year, the Jackson County 4-H’er won awards at both the regional and state 4-H horse shows. What makes Warren unique is that he is also hearing impaired. But Warren is very much a “people person” and doesn’t like feeling different from anyone else. 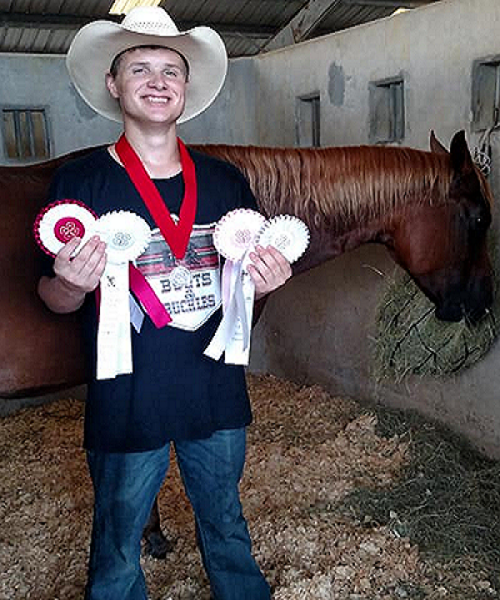 His mother, Melissa Loper, recently talked to me about his 4-H experience and how it has played a role in helping Warren build confidence and achieve success regardless of his challenge. At two weeks old, Warren was diagnosed as being completely deaf due to improper functioning hair follicles in the Cochlea. At 15 months of age, he received a Cochlear implant that was activated at 18 months of age. Melissa said Warren didn’t like the Cochlear implant at first because it allowed for all sounds to be heard at once. He had to learn how to drown out background sounds. The implant had to be turned down completely and then slowly raised to a level that was tolerable. His ability to handle the implant increased as he got older. Melissa says there are times when Warren would rather not be able to hear. One of the key components of 4-H is developing life skills and providing a safe and inclusive environment for all youth regardless of their physical or mental conditions. 4-H allows all youth the opportunity to explore their areas of interest. For Warren, the 4-H horse project allows him to learn the valuable life skills that come from raising and showing a horse and also allows him to exhibit mastery of learned riding skills in competitive events. Youth involved in the 4-H Horse Project learn more than just the science behind feeding and caring for a horse, and how to properly ride. 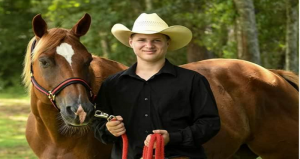 Youth also compete in contests such as horse bowl, demonstrations, public speaking and art. Youth participating in this projects use their horse as a tool to increase their knowledge and enhance their life skills making them more productive young people. To find out more about the horse project in your county, contact your local UF/IFAS Extension office. This time last year, we were helping our 4-H friends all over Florida recover from Hurricane Irma. Hurricane season has been quiet in Florida so far, but that doesn’t mean we need to let our guard down – we still have two more months of hurricane season. So,what would you do if you didn’t have electricity? 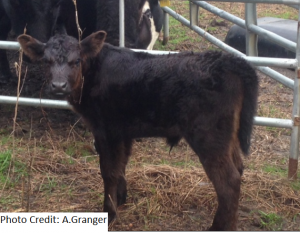 How will you care for your 4-H project animals? Do you have an evacuation plan? Answers to these questions become major issues when dealing with disasters. Disasters can be natural/weather-related, man-made or accidental. Regardless of the type, it’s important to be prepared and have a plan for you and your animals. Be ready to leave once the evacuation is ordered. Evacuate animals as soon as possible. Your project animal won’t be able to stay with you in a shelter like a dog or a can. Know where safe livestock facilities are in your area or along your evacuation route. If you can’t evacuate, decide if you’re keeping animals confined to a barn or turning them out into pastures. Barn confinement may become dangerous and take away the animal’s ability to protect themselves. Pastures should be at least one acre in size with no potential hazards (barbed wire, power-lines, polls or items that can be picked up by the wind). Check with your local humane organization, extension office or local emergency management agency to read about your county disaster response plans. Determine safe evacuation routes for trailers and livestock. Prepare a Farm Disaster Kit and Basic First-Aid Kit. Remember, supplies during or after the disaster may be in short supply, or roadways may be blocked. Keep kits up-to-date, keep them on-site and in your vehicle. Sanitation items, cell phone, flashlights, portable radios and batteries. 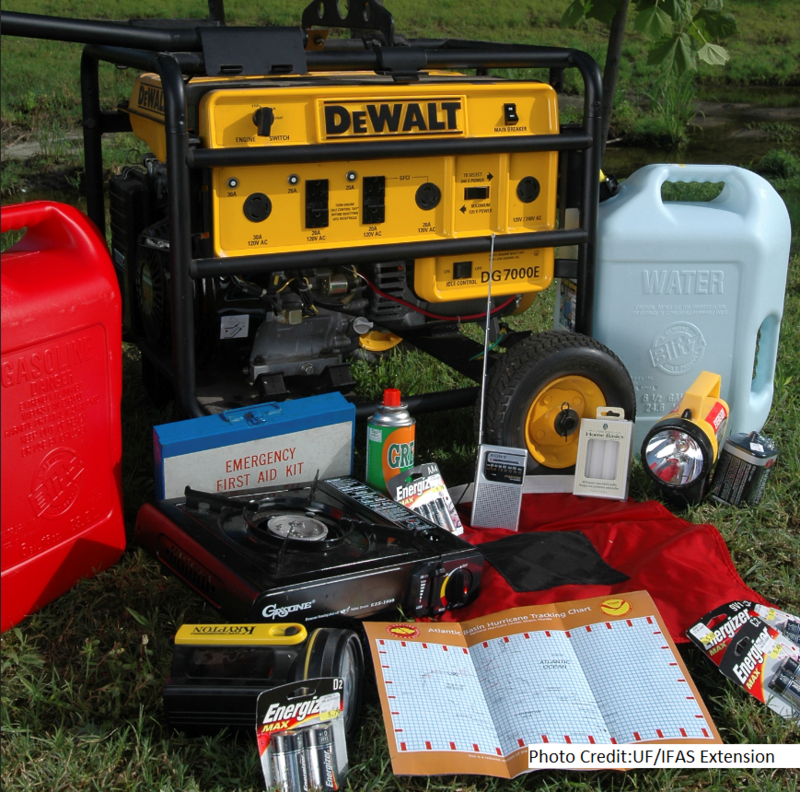 Have feed, water, handling equipment, tools, veterinary supplies and a generator (with fuel) on hand if possible. Make a list of emergency numbers – veterinarian, neighbors, state veterinarian, animal shelter, county extension office,local volunteer organizations and someone outside of the disaster area. Make sure you have proof of animal ownership. Have temporary ID supplies on hand like permanent markers and plastic bands that are safe, durable and visible. ID should include your name, address, and telephone number. Poultry need access to high areas to perch if you’re in an area susceptible to flooding. Provide access to clean water and food. Remove barbed wire or other fencing so animals can move to areas of safety during flooding or high winds. Secure items that might be picked up and thrown by the wind like pieces of metal, troughs, tanks or trailers. Ensure there is safe shelter, fencing or pens. Keep animals in groups they’re used to where they are securely contained and protected from the elements. For more information about 4-H, contact your local UF/IFAS County Extension Office. If you are an adult or teen with skills or knowledge you’d like to share, ask about becoming a 4-H volunteer! 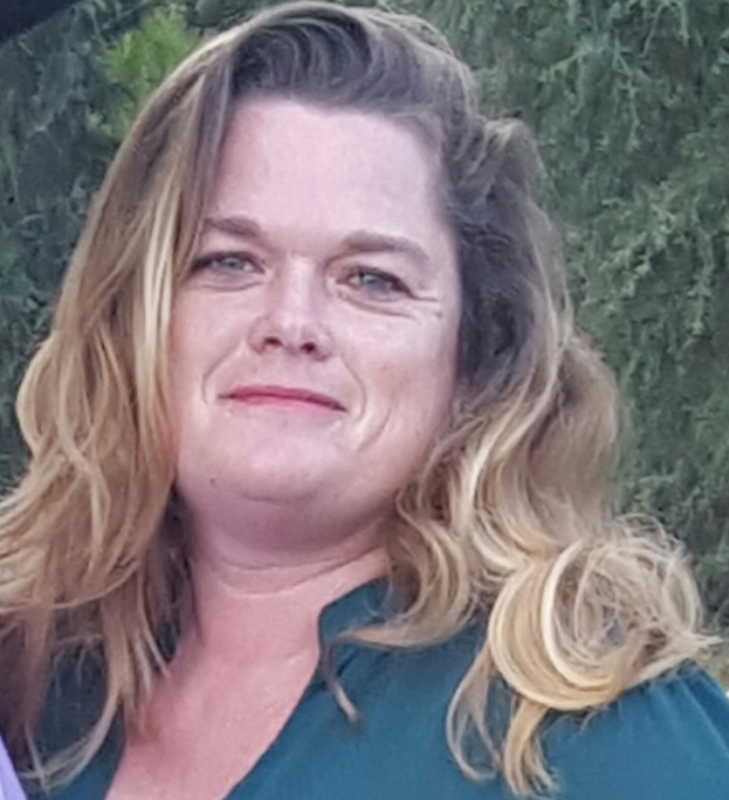 Location– the first thing you need to find out is whether or not your location is zoned for poultry and whether or not there are any building restrictions. If there are no restrictions on your property, you will want to select a location that is relatively flat, has good drainage, access to electricity and water, and some natural shade if possible. If you do live in a restricted area, contact your local UF IFAS County Extension Office– many offices have cooperative coops where youth can participate in the poultry project, even if they can’t have their own backyard coop. Goal– Next, you need to consider what your goal is. Do you plan to produce just eggs or are you considering producing your own meat? Are you more interested in showing your chickens? How big of an operation are you planning? Heavy breeds– such as Australorp, Barred Rock, or Buff Orphington need 4 square feet of space if allowed out to forage during the day, but 10 square feet of space per bird if they are kept in the coop. Light breeds– such as Leghorn, Araucana or Silkies need 3 square feet of space per bird if allowed to forage, but 71/2 square feet of space per bird if kept in the coop. For more information on selecting breeds, check out this article: Which Breeds are Best for Backyard Poultry. 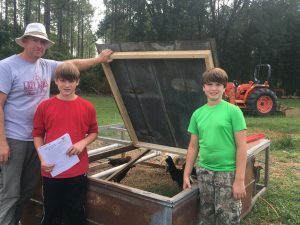 Coop Style– Chickens have been around for thousands of years so they are pretty resilient, but you still need to consider giving them proper shelter and protection from the elements and predators. Make sure that your coop has the capability to repel predators that fly, dig or crawl. Chickens are susceptible to birds of prey such as hawks and owls as well as predators on the ground including snakes, opossums, raccoons, coyotes, dogs and cats. There are many styles to choose from and you can spend a lot or a little, depending on your budget or your skills as a carpenter! Links to a few example coop plans are provided in the resources below. 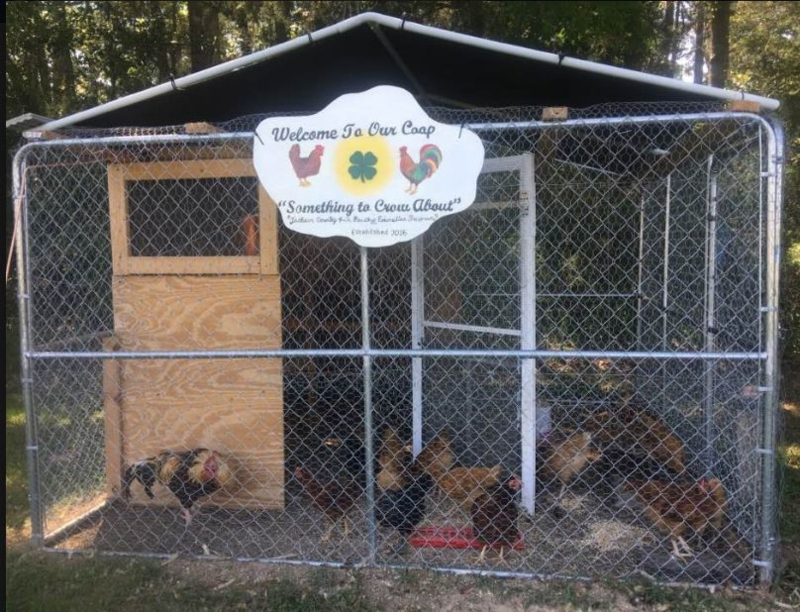 Many hardware and feed supply stores have “coop kits” for sale that are easy to put together. Generally, these coops are for small numbers of birds and are easy to remove should you change your mind about having a backyard flock later. The coop shown above was constructed with a 10 x 10 chain-link dog kennel and a canvas kennel cover. The roof and sides were laced with poultry wire which was also buried 8-10 inches in the ground around the perimeter. An enclosed area with laying boxes was constructed out of scrap lumber, an old screen door and a roll of window screen. All of the components give the birds protection from the elements and predators. Make sure that your coop site has access to electricity and water. If you have decided to incorporate some of the 4-H activities such as embryology or Chick Chain, you will be starting with day-old chicks that will require a little different living environment, at least until they can keep themselves warm and are big enough to be put on the ground. Regardless of the age of the birds, make sure that you are providing adequate amounts of fresh feed and clean water every day. Once your birds are mature enough to lay eggs or be used for meat, you will enjoy having a great source of protein and a valuable teaching tool for youth. Learning skills such as record keeping and responsibility are just two of the skills that come to mind. 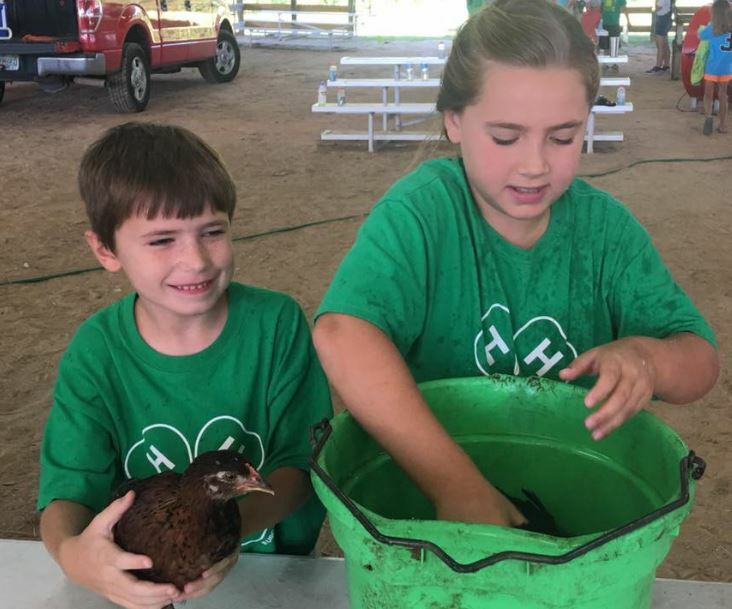 Not to mention opportunities in learning to show or exhibit birds, learning about poultry and meats judging, earning scholarships in the 4-H Tailgate Cookery Contest and developing entrepreneurial skills in producing eggs or meat for your family or others. There are multiple opportunities in 4-H poultry project. If you are interested in participating, either as a youth member or an adult volunteer, contact your local UF IFAS County Extension Office or visit http://florida4h.org.